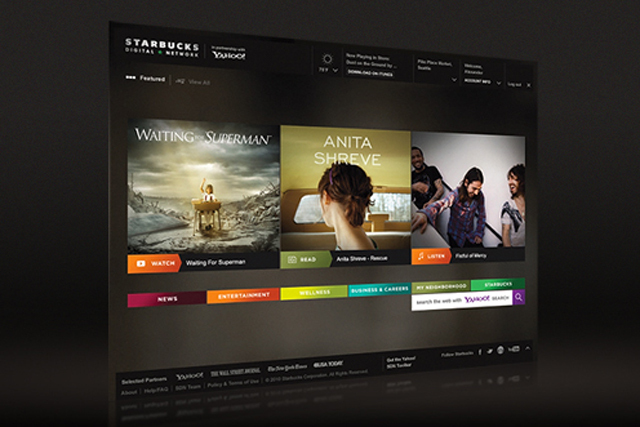 Starbucks plans to make its digital content platform available in its UK stores. The Starbucks Digital Network launched in the US in October. It features a Yahoo!-branded content portal that allows customers using Starbucks' in-store Wi-Fi to access news and lifestyle content. In the US, partners include Apple, The New York Times, The Wall Street Journal, LinkedIn and Foursquare across News, Entertainment, Wellness, Business & Careers, and My Neighbourhood channels. A sixth channel features news on Starbucks products and links to Twitter and Facebook.